David McCampbell was born to lead and succeed. Even at a young age, he already knew what he wanted in life. He did not only succeed as a student but he had various awards in sports. As he joined different military academy, his passion to lead and win any combat lead him to many awards and achievements. David Campbell was born in Bessemer, Alabama on January 16, 1910, his parents were Andrew Jackson and E. La Valle McCampbell. At the age of 13, he left home to enrol in the Staunton Military Academy located in Virginia. He later attended Georgia Tech in Atlanta before he received an appointment in 1929 to the U.S Naval Academy by Senator P. Trammel. While he did well with his studies, he also excelled in sports. In 1931, he became the A.A.U Diving Champion in the Mid-Atlantic States and in 1932; the Eastern Intercollegiate Diving Champion. A year later, he graduated with a degree in Marine Engineering from the Naval Academy. However, he was dismissed due to Congressional legislation which limited officer commissions but then enlisted as an Ensign in the U.S. Naval Reserve. David Campbell was raised in West Palm Beach, Florida. There were no specific details regarding any siblings he might have. In the records, he is listed as David S. with no middle name or middle initial. This was proven by his Annapolis record and the Medal of Honor citation. He was married to Wayne Morris, a movie star. They had a son named David who also graduated from the Unites States Naval Academy. Christopher David McCampbell who was from San Diego, California was his grandson. 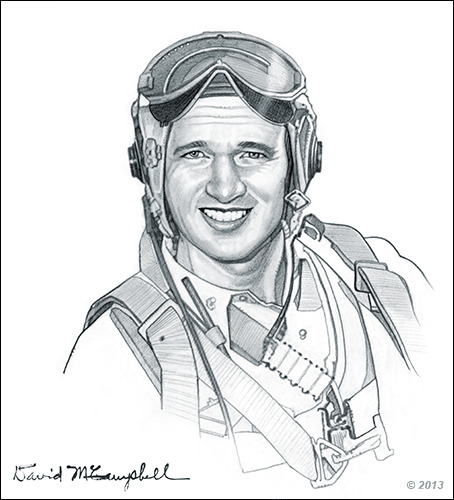 As a U.S. Navy Pilot David McCampbell was able to win 34 aerial combats during World War II. 1935- 37 - He was aboard working in a cruiser. 1838 – Wings of Gold were given to him and he was assigned to Fighting Squadron Four on the East Coast. September 1942 – He became a landing signal officer and survived the sinking of USS Wasp. September 1, 1943 – He formed the VF-15. February 1944 - September 1944 - He was assigned as the Commander of Air Group 15. From April to November 1944 – Air Group 15 had continuous combat and had joined 2 air-sea battles. June 19, 1944 – He shot down 5 Japanese dive bombers. October 24, 1944 – He was the only American pilot who was able to become an ace in a day. 1959 – 1960 – He commanded the carrier USS Bon Homme Richard. He was also the Plans Division Chief of the Joint Chiefs of Staff. 1964 – He retired from active duty. you had him licked before you started shooting." I brag about the planes I shot down, but I don't brag about the number of people I killed. For 32 years, all I did was try to forget all of it." David McCampbell died on June 30, 1996 in a nursing home in Rivera Beach, Florida. His body was laid to rest at the Arlington National Cemetery. Navy Cross – McCampbell received this award for his exemplary achievement as a Commander of Air Group 15. Silver Star – This award was given to him because of his exceptional leadership with Air Group 15. Legion of Merit with Combat “V” - This award was given to him because of his exceptional achievement while commanding the Air Group 15. Distinguished Flying Cross with 2 gold stars was given in place of the second and the third awards he had gotten. 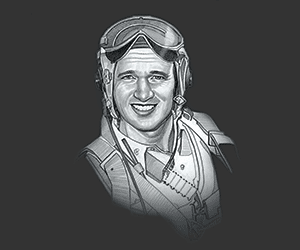 Air Medal – This was given for his outstanding aerial combat skills. He received a citation for risking his life beyond the call of duty during an aerial combat with Japanese aerial forces in the Philippine Sea. This picture of David McCampbell is Copyright © June 2014 Siteseen Ltd. We only allow this picture to be used for printed non-commercial purposes and particularly encourage it's use for printed educational non-commercial purposes. This David McCampbell picture is not in the Public Domain. 3) Use of this David McCampbell picture, or any of our pictures on websites re-distributing copyright free material is strictly prohibited.